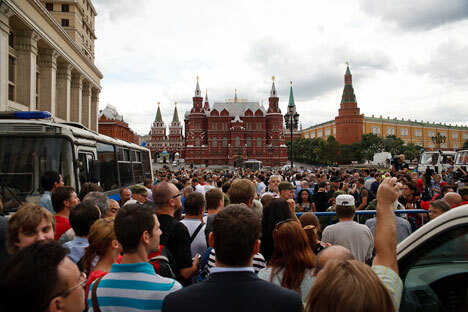 Opposition stages mass rallies in Moscow and other cities. On Thursday, July 18, Alexei Navalny, a prominent member of Russia’s liberal opposition and anti- corruption activist, was sentenced to 5 years in prison after being convicted of financial fraud. Rallies in the regions were not as massive as in Moscow. The biggest crowd—more than 500 people—gathered in St. Petersburg. Twenty-five people were arrested. The guilty verdict had been anticipated, and, a week in advance, the opposition called for a rally on Manezhnaya Square, referring to it as a “gathering.” This word was purposefully used: Obtaining official permission for a political rally is problematical, but no one can forbid people from gathering in the city center. At least, so it seemed. On the day before the gathering, repair work began on Manezhnaya Square. By Thursday evening, all the entrances to the square had been blocked by police and Interior Ministry troops. Tow trucks, police vans, military trucks, water trucks, the army, special units in full gear—this was what the city center looked by 7 p.m. Yet people kept arriving: 7,000, and then more and more. Okhotny Ryad, Mokhovaya Street, the adjacent stretch of Tverksaya Street, the space in front of the Bolshoi Theatre to the Lenin Library, on both sides of the streets—in fact the entire center of Moscow was filled with people. As a result, instead of a rally, it developed into something more: a grandiose demonstration. What was striking was the absence of any flags, posters or banners. It was a silent confrontation between the crowd and the police. Only occasionally would somebody shout, “Shame!” or “Not guilty!”—only to be grabbed by the police and dragged through the police cordon toward a police bus. A total of 200 people were detained. There was a cyclist who shouted in support of the protesters being arrested. First, they grabbed the cyclist himself. Then, a sergeant asked a colonel, “What to do with the bike?”… “This is his personal property.” So the bike was arrested, too, and thrown into the bus. Students with dreadlocks and iPads, owners of expensive, foreign-made cars, retirees and managers all stood side-by-side or strolled back and forth. The crowd included some people who would hardly be seen together any other time: Orthodox activist and nationalist Dmitry Enteo, next to Conceptualist poet Lev Rubinstein and, nearby, former Kremlin spin-doctor Gleb Pavlovsky. On a building façade stood the young, left-wing radical Matvey Krylov of the Just Russia party. There were people on all the façades. They whistled, applauded and took pictures. “Protest actions, rallies and flash mobs are necessary, but we should take part in elections and monitor the polling stations. People have come here to defend their right to fair elections. There is nothing you can do about them,” said Sergei Mitrokhin, leader of the Yabloko party. “This is our city” is one of Navalny’s rallying cries. On the evening of July 18, the city center, having been divided into squares by police cordons and jammed with special forces and vehicles, did indeed belong to the people and not to the bureaucrats. The crowd dispersed by 2 a.m. People came away with a sense of having won a victory. By morning, as it turned out, Navalny had been released from custody.